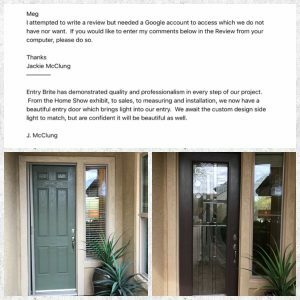 Entry Brite has demonstrated quality and professionalism in every step of our project. From the Home Show exhibit, to sales and installation, we now have a beautiful entry door which brings light into our entry. We await custom design side light to match, but are confident it will be beautiful as well.